Whenever someone is considering whether or not to pursue a personal injury lawsuit one of the most important factors for consideration is how much the claim will likely be worth. Another key thing prospective plaintiffs often consider is what their chances of winning or losing the case will be. Unfortunately there is really no way to scientifically estimate how much a particular personal injury case in West Virginia (or anywhere else) might be worth. There are simply too many variables that can affect the ultimate value of case. However, we can get some idea of average value ranges by analyzing all the publicly reported settlements and jury verdicts in West Virginia personal injury cases. There are a number of legal information services that track and report verdicts and settlements for legal research companies like Westlaw and Lexis. This means that the results and case details of every jury verdict in West Virginia civil injury cases going back at least 20 years is searchable. This includes jury verdicts in favor of the defendant(s). In addition to jury verdicts, these databases also include out-of-court settlements that are publicly reported. Most settlements are private, so the data on settlements only includes a fraction of all cases. On Westlaw, jury verdict and reported settlement data for West Virginia dates back to about the mid-1990s with anything before 2000 being limited to jury verdicts only. A search of this data for West Virginia shows a total of 1,074 verdicts and reported settlements in civil tort cases involving personal injuries. This includes everything from simple auto accidents to major medical malpractice and pharmaceutical liability cases. Public reporting of settlements in West Virginia appears to be somewhat less common compared to other locations so the majority of the cases in this database are jury verdicts. One of the first things that jumps out from an analysis of the personal injury verdicts and settlements in West Virginia is that there are surprisingly few defense verdicts. Out of the 1,074 total cases only 111 were verdicts in favor of the defendants (i.e., the plaintiff lost and got nothing). 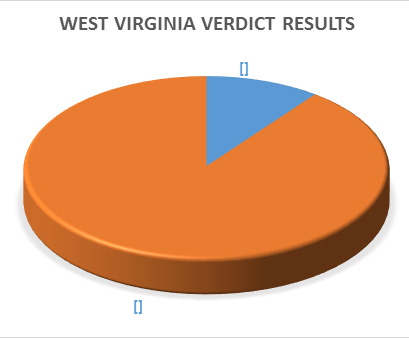 This indicates that personal injury plaintiffs are winning 90% of the jury trials in West Virginia. Even though this is somewhat skewed by the inclusion of reported settlements which only get counted as Plaintiff Wins, this is still a very high ratio of plaintiff success compared to other jurisdictions. When you do the same search of verdicts and settlements in most other states defense verdicts usually account for half of the total results or more. If we take out the 111 defense verdicts we are left with a total of 963 personal injury verdicts and settlements in which West Virginia plaintiffs got financial compensation. An analysis of the total amounts awarded shows that the vast majority of these cases were valued at $100,000 or less. 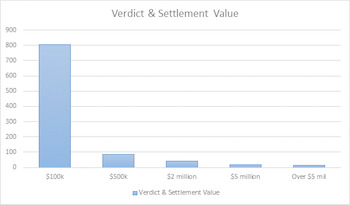 Just over 83% of the verdicts or settlements were under $100,000 with the majority being in the $20,000-$50,000 range. This is fairly typical for most jurisdictions because the majority of tort cases involve auto accidents. Damages in auto accident cases are generally lower compared to other types of personal injury cases. Only a small handful of the total personal injury cases ended up at the very highest end of the value scale in West Virginia. Only 15 of the 963 total cases involved verdicts or settlements in excess of $5 million. This is only about 1% of the total. This does not mean that plaintiff in West Virginia don't get big verdicts in major personal injury cases. Keep in mind that most of these cases are smaller auto torts. In any event 57 of the personal injury cases in West Virginia ended up being worth more than $1 million. Below are sample summaries of some of the West Virginia verdicts and reported settlements in personal injury cases. Plaintiffs v Recycling Plant (West Virginia 2018) $33,000,000 settlement: 27-year old and 2 brothers (38 and 39 years old) are working a metal recycling plant processing highly combustible components of aluminum. All 3 are killed in a massive explosion at the plant and their survivors bring wrongful death actions alleging that the company failed to follow numerous safety procedures. The company agrees to a global settlement of all 3 cases for a total of $33 million. Adkins v Covelli (West Virginia 2017) $5,700,000 verdict: 37-year-old female patient undergoes surgery to have her thyroid removed. The surgery ends up causing serious damage to her laryngeal nerves requiring additional corrective surgery and leaving her with permanent vocal cord paralysis. She sues the surgeon alleging that he botched the procedure by failing to accurately identify and locate her laryngeal nerve so as to avoid damaging it. The surgeon denies any wrongdoing and claims that laryngeal nerve injury is a known risk of the procedure. The jury in Kanawha County finds the doctor was negligent and awards $5.7 million. Cunningham v Braxton (West Virginia 2012) $5,113,728 verdict: middle aged female plaintiff is walking to her car in the parking lot of Bigley Foodland Fresh grocery store in Charleston when defendant driver runs her over while making a left turn. Plaintiff suffers massive brain injury which leaves her severely mentally impaired. She sues defendant driver and the grocery store and a jury in Kanawha County awards $5.1 million. Bias v Kroger Co (West Virginia 2016) $241,000 verdict: plaintiff is shopping at Kroger grocery store in Holden, W. Va. Another shopper knocks several soda bottles to the floor and they burst open. Store employees are notified of the soda spill but only drop a few paper towels down before plaintiff slips and suffers various soft tissue injuries to her neck and back. She sues Kroger for premises liability and the Logan County jury awards $241,000 in damages. Keeling v Hanson (West Virginia 2016) $541,000 verdict: defendant truck driver loses control of his rig and spills load of lumber across the highway causing plaintiff's motorcycle to crash. Plaintiff suffers rib fractures, and tears several ligaments in his knee. He undergoes 2 surgeries and is eventually forced to retire from his job as a fence installer. He sues the truck driver and trucking company. Liability is fully admitted but the nature and extent of the alleged damages are disputed. After a 3 day trial the jury awards $541k in damages which includes $375k for pain and suffering. Eastham v State Farm (West Virginia 2017) $22,100 verdict: plaintiff suffers right rotator cuff tear and cervical and lumbar strains when she is rear-ended by uninsured driver. Here auto insurer, State Farm, denies her uninsured motorist claim and the case goes to trial. A jury awards plaintiff $22,100 in damages. Rakes v CSK Transportation (West Virginia 2016) $47,315 verdict: plaintiff railroad worker allegedly suffers carpal tunnel syndrome requiring surgery after performing repetitive stress motions as part of his job loading coal cars over 29 year period. CSX denies any negligence. Jury finds CSX is 95% at fault and awards $47,315 in damages. Do you have a possible personal injury case in West Virginia? The injury lawyers at Miller & Zois can help you evaluate the potential value of your claims and bring a lawsuit. Call us at 800-553-8082 or get an online consultation.